I'd like to share with you the Whisper Challenge project that I am working on, but it is a secret. Just know that I'm working on something pretty crazy... It is what is on my design wall right now. I have Kottontails to share with you. I just finished the binding, sleeve, and adding all the buttons to give them eyes as well as dress up their chests a bit. 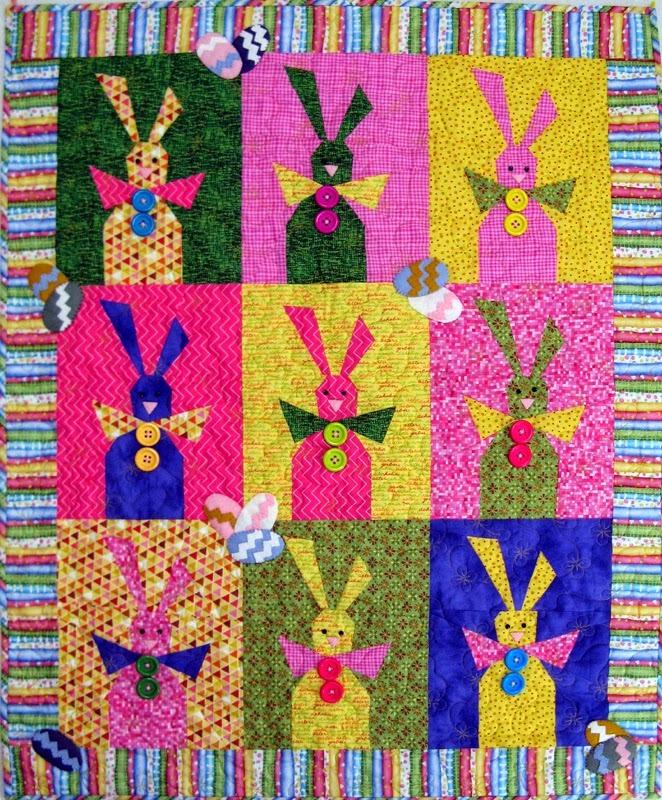 This very cute bunny quilt will be gracing my home next Easter. It is a Buggy Barn design called Bunny Trail from the Stir Crazy book. I'm hopeful the next Buggy Barn design I will be working on is Crazy as a Bird Dog. Wait till you hear the "K" name my Sister came up with for it. 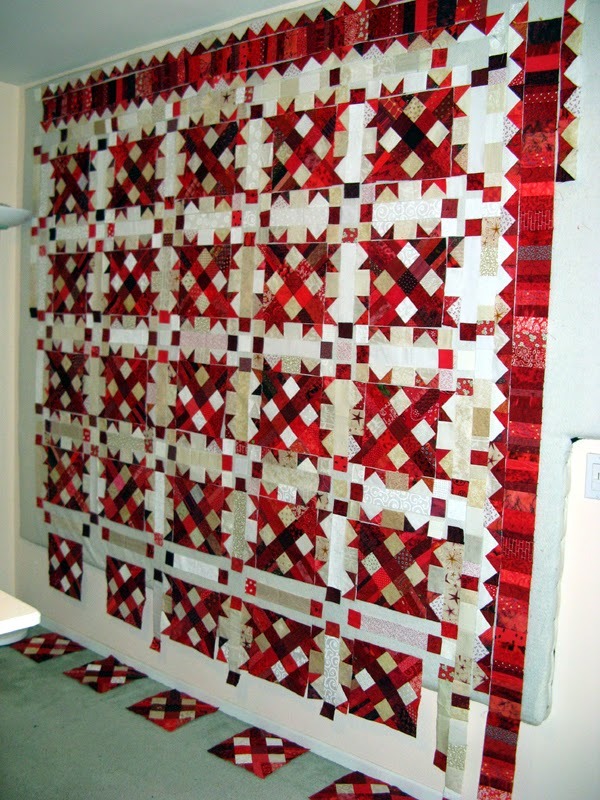 Take time to visit Judy's Patchwork Times to see many other great projects from quilters from all everywhere. 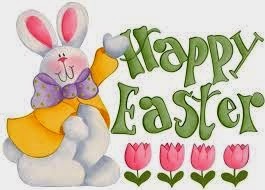 Have a great last week of April and first week of May! I have my April 2014 UFO done! I really like the way Kranberries turned out. 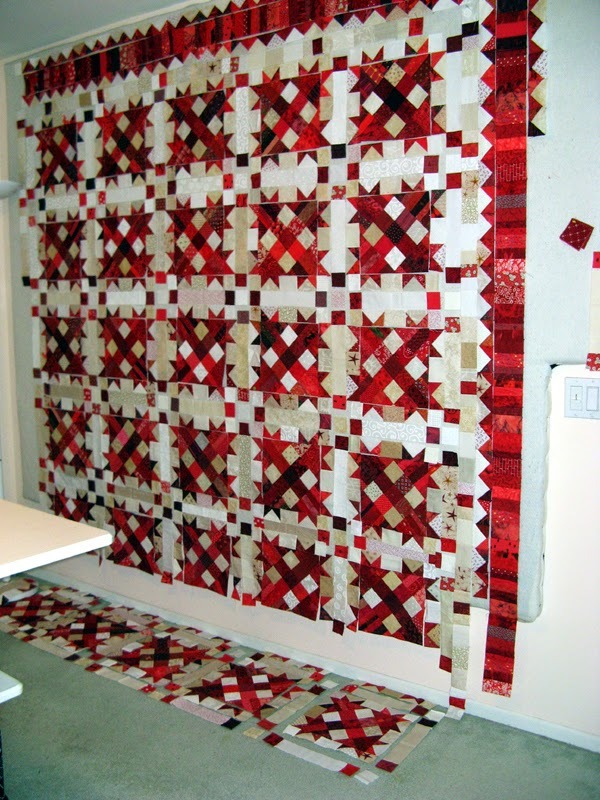 This project started out with a Red Strings/Nine-Patch Swap with several other quilting buddies. The Red Strings are used in each block in the corners. 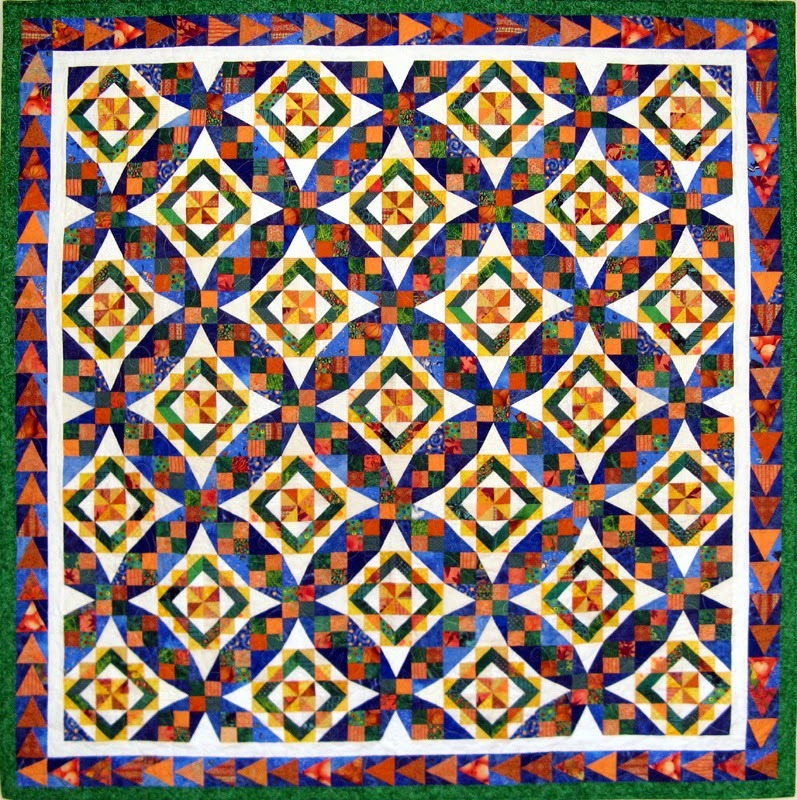 The Nine-Patch is the center of each block. Someone put a pink square in their Nine-Patch...I thought about changing it out, but decided instead to leave it. I think it adds interest; what do you think? 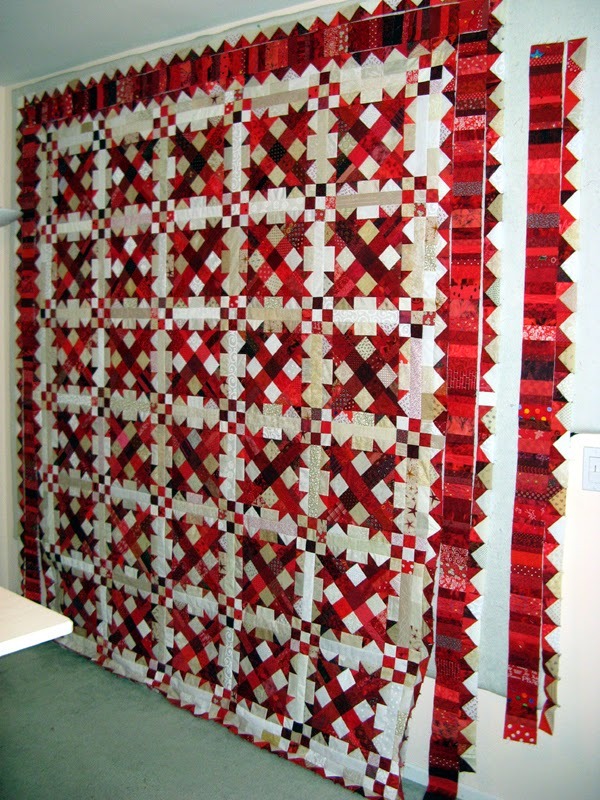 This is a big quilt! The design is Bonnie Hunter's Talkin Turkey from her String Fling book. Thanks Mom and Kerry for helping out with some of your red stash. I don't think I purchased much more than a few fat quarters. I managed to assemble double the quantity of flying geese units and there has ended up being lots of string border sections leftover. I am sure I will find a use for these orphans some time in the future. Finally there is a change to my stash statistics! Anxious to see what May's UFO will be. I will be finding out on Thursday. More to see through the links at Patchwork Times. Enjoy your Sunday! On my Design Wall today is Kranberries. I have been sewing pretty steadily this weekend. I have the first border of flying geese sewn in place. Next is the string border. I have all the string sections sewn; only need to measure for size and sew in place. The last border of flying geese is sewn too; it will be next. It is coming together pretty quick now. I won't be able to get this one off the floor. The string and flying geese section that is on the far right goes on the bottom...wow this is one big project. It was great having the strings and nine patches done in the most recent swap. This project has to be kept in the bag! 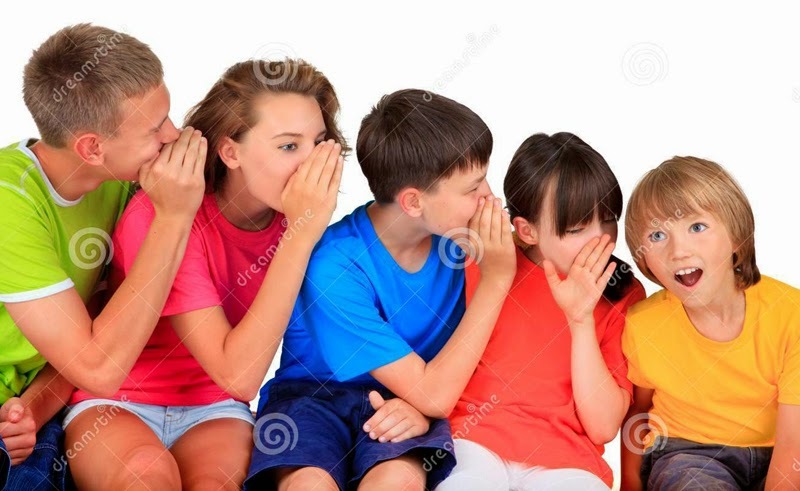 It is a secret... Anyone ever done a Whisper Challenge? I have a plan in mind. I will be starting this project as soon as Kranberries is done! Enjoy your week! More to see through the links at Patchwork Times. I was reminded by Bonnie that I did have some stash used last week. I have been helping her with Batik strips for a project she is working on. A Judy Niemeyer design that requires a lot of gradating. All said she has three yards from my stash that will give her just what she needs. I have had no other used or purchased fabrics this week. Just getting back into sewing these last couple of days. I have two quilts finished today. Both are Bonnie Hunter designs, Celtic Solstice and Split 9 Patch. There hasn't been much time to sew on Kranberries (also a Bonnie Hunter design, Talkin' Turkey) while my nephew visited, but I did find time for some hand sewing. We had a great time seeing many sights around San Diego. I think we were good luck for the Padres on Sunday with a win! Nothing to change my stats this week. I've been way too busy. This has to be one of the busiest I've been in awhile. I have been enjoying spending time with my nephew. Today doesn't change things one bit...going to see the Padres vs the Tigers. There just may be an opportunity to catch a ball on the third base line! Anxious for a great day. Kranberries looks very much the same as it has been the last few days, but there is progress. April 15th is looming...a good part of my Sunday was devoted to paperwork. Both were e-filed; thank goodness that is over for another year. Next came putting pieces of batting together for two projects and laundry. Tickets were purchased for the play Quilters that Kerry and I will be seeing on Wednesday. Will Call will have them ready for us to pick up an hour before the show. Then it was Amazon for ink supplies. Last minute finishes to Sunshine's BOM package that I am coordinating this month. Finally, time for sewing! 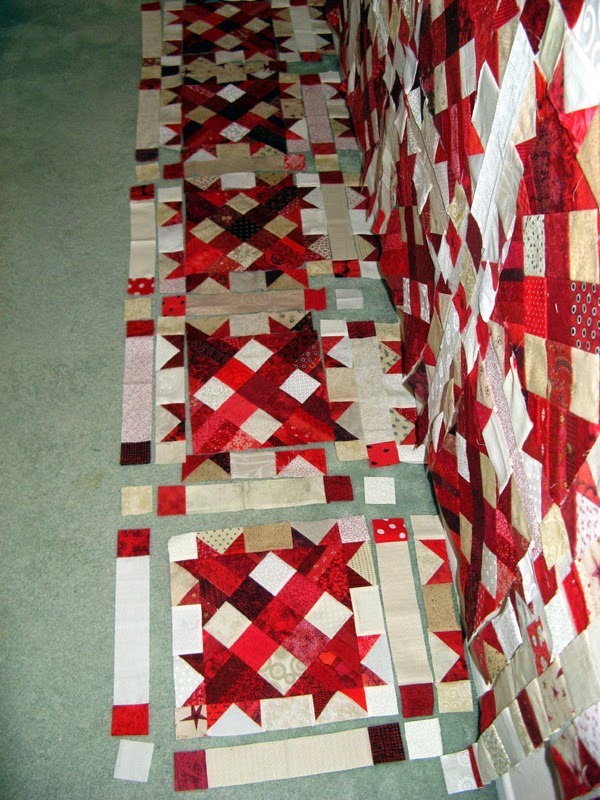 I finished all the sashing units and flying geese sashing for the main blocks. Then it was time for dinner making and kitchen clean up... What a busy Sunday. Netflix brought Gravity on Saturday that we have been anxiously awaiting. I was able to just get in the sewing of one complete block before it was time for the movie to begin. I plan to be back to Kranberries tonight. I'm so anxious to get it off the floor! I hope you have more time than I have recently to be sewing... Slip in some time to enjoy other projects at Patchwork Times. Enjoy your week! Today I am working on my Kranberries. I swapped units with Kerry yesterday which gives us both just a little bit more variety. I am assembling today. Anxious to get this project as far along as I can before my busy week gets going. The photo is one that I posted on Friday, but it hasn't progressed much from this image. These two projects came back from Kerry's yesterday. Kwiver and Keltic Krest. It seems I have only Bonnie Hunter designs to show you today. Kranberries is her Talking Turkey, Kwiver is Split 9 Patch Leader and Ender Summer 2013 Challenge, and Keltic Krest is Celtic Solstice the 2013 Mystery. Tuesday Sunshine Guild April meeting where I will be coordinating the Block of the Month. 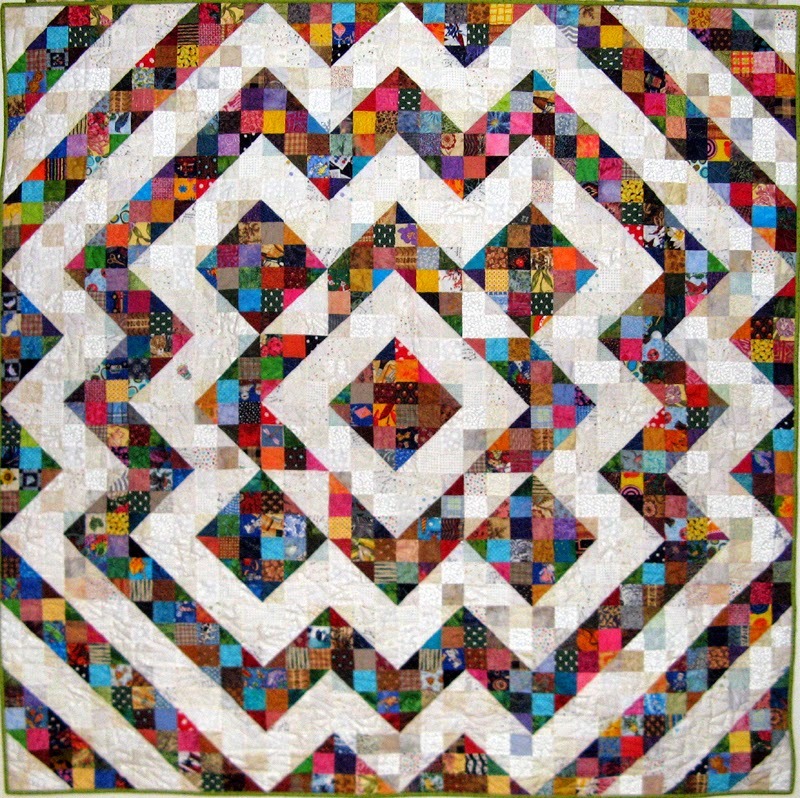 Karen Brow of Java Quilts is our speaker. I signed up for her workshop that will be in early May. She has the cutest animal designs. We will be making her newest design that is full of turtles; to include one just hatched. More on this in the coming days. Wednesday Kerry and I will be going to the play Quilters by the Lamb's Players. A coworker's daughter is one of the main actresses. A real girls play I've been told. It will be a fun night. Thursday has my nephew Austin coming in to town from Virginia. It will be his first solo flight. I wonder after the long flight across country if he will want to do it again? I have lots of things planned for us to do. 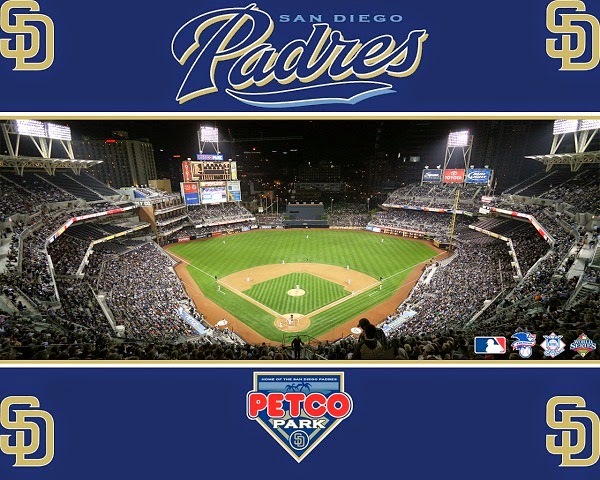 There is the U.S. Maritime ships to tour, Balboa Park with lots of museums, and a Padres baseball game...just to name a few...yes I plan to spoil my 16+ year old nephew for almost a week. Thanks to my blog friends for helping to come up with some great "K" names. 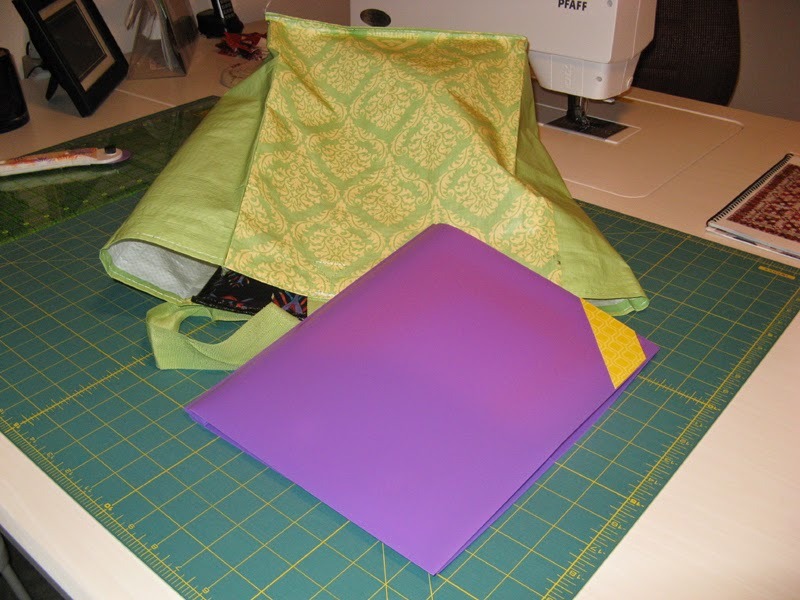 I stayed away from fabric stores this week and finishes...probably will be reporting the same next Sunday. Kranberries is close, but not sure today an tomorrow night will see a finish before the end of the month. I' am sure anxious to increase the amount of fabric in the Used Category. This sure was difficult to photograph. As you can see Kranberries has grown! I don't have too many units to assemble before I'll be putting everything together. Sunday is going to be a BIG sewing day for me. How about you? Born and raised on the East Coast and settled in 1985 in the paradise called San Diego, California. 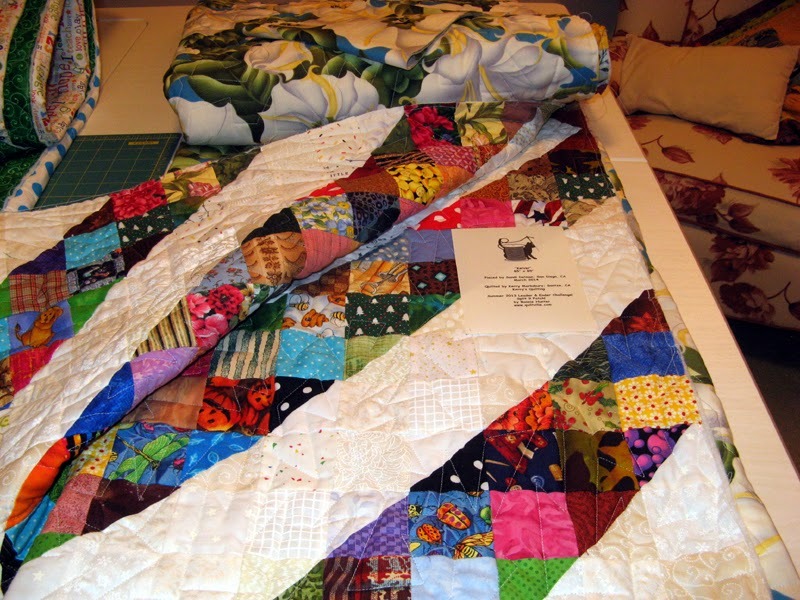 I've a passion for scrappy, traditional pieced or paper pieced quilting. I enjoy the challenge of using my stash. 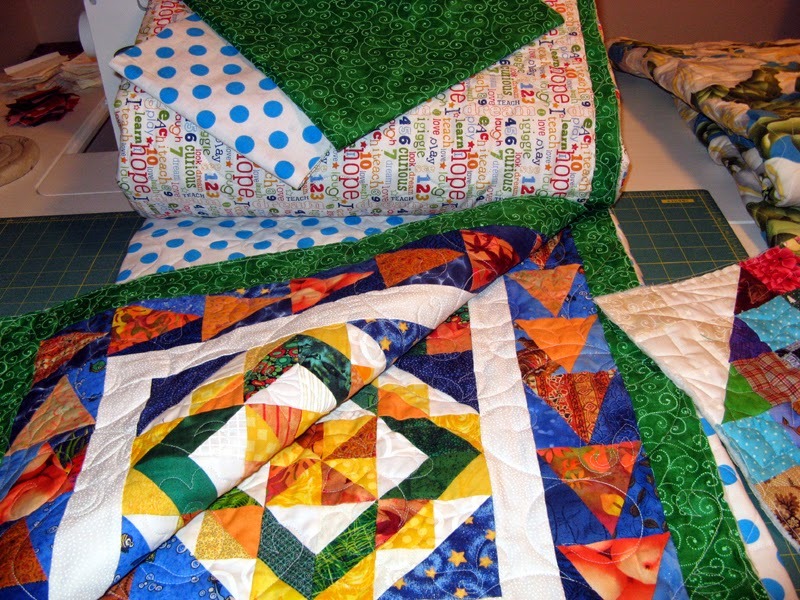 I have strong thoughts of applique and hand quilting when I don't have to keep my day job. 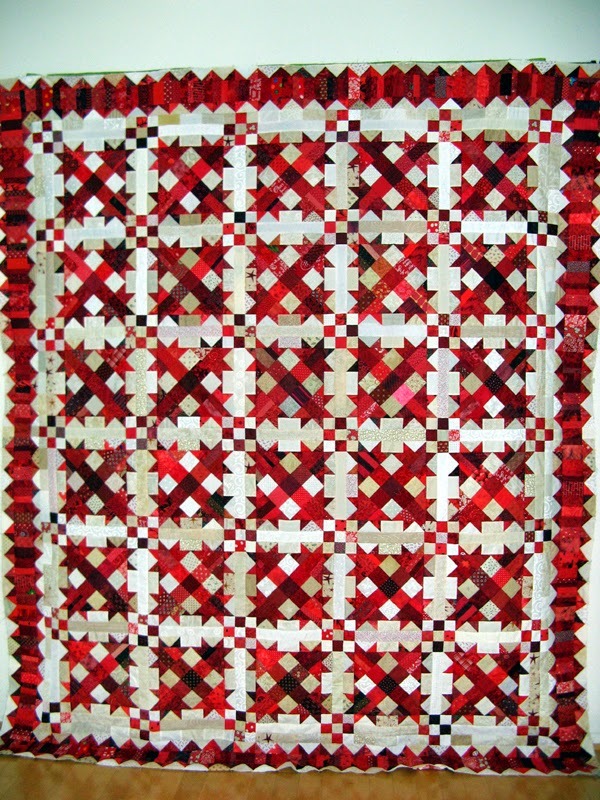 Quilting and sewing have been passed down in my family for at least four generations. I'm lucky to share this passion with my Mom.